Enjoy a pleasant 1 ½ hour Sunday Brunch aboard a triple deck riverboat with a slow turning paddle on the stern, the kind that in the early 1900s made the journey upriver to Augusta. 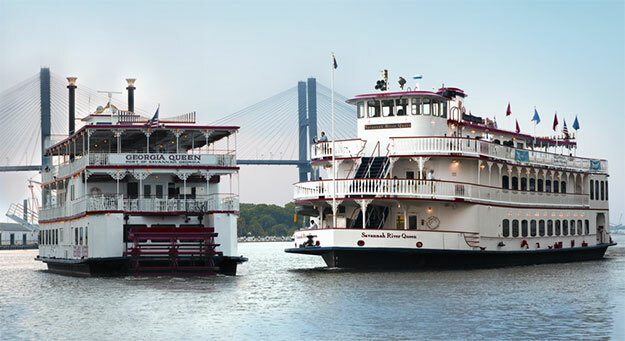 As cruising upriver is no longer viable, a leisurely Savannah Riverboat Brunch Cruise around Savannah Harbor offers a different perspective of the city and the 21st century activity along its waterfront. Kick back, get off your feet for awhile, enjoy being on the water with a nice breeze blowing, watch the waterfront and the huge ships going by while savoring Low Country shrimp and grits, eggs Benedict, omelets, quiches, fried chicken, ham, waffles, biscuits and gravy, salads, fruit, and desserts. The riverboat has the look of a bygone era so the expectation might be that the views along the Savannah River will also be of another more languid time too – moss-draped live oak, gracious homes and shady gazebos. This is not the Savannah River of today. No longer pristine at the point it reaches Savannah on its 301 mile journey to the sea through forests, agricultural lands, large hydroelectric reservoirs, swamps, industrial complexes, this is where it broadens into a tidal estuary and becomes the shipping channel for the Port of Savannah, the nation’s 4th largest port for oceangoing container ships. Savannah has a working waterfront. It always has. The river has always been a conduit of goods from inland to the coast. It is what it is today because its protected location 18 miles upriver from the Atlantic Ocean, a defensive position recognized not only by John Oglethorpe when he established his colony on the site in 1733, but also by traders and native tribes before him. The only difference between then and now is what’s being traded and how. Aboard the riverboat, the views looking towards the water from the large viewing windows in the climate controlled dining room or from under the canopy of the open-air upper deck, are primarily of what lies along and above sea level River Street. From the water, it’s easy to see that the city really does sit on a high bluff. Along the bluff, the golden dome of Savannah’s City Hall glints in the sun and architectural elements mix the old with the new. Waving Girl stands out,greeting every passing ship, including riverboat guests! Wave back!